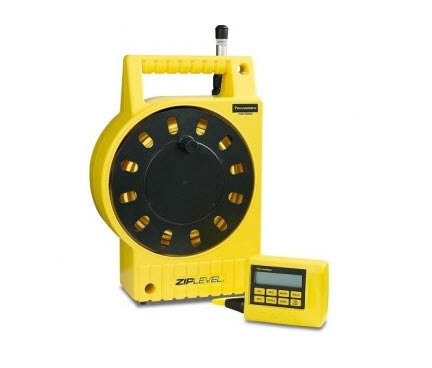 Ziplevel® is a high-precision pressurized hydrostatic altimeter. It works much like an aircraft altimeter that measures the weight of the air above it except that it does not use the atmosphere to measure elevation. Instead, Ziplevel is a pressurized system that measures the weight of a proprietary liquid sealed within its cord relative to a reference cell in the hub of its reel. This makes Ziplevel 10,000 times as precise as an aircraft altimeter and immune from barometric pressure and altitude changes. Its internal pressure prevents bubbles from desorbing from its liquid when under vacuum when the module is above the base unit, which is one of its patented features. Ziplevel® is capable of measuring a circle more than 61 m (200 ft) and 12 m (40 ft) vertically on one set-up with 0.050 internal precision. Its high-precision functions will measure more than 1.2 m (4 ft) vertically with paper thin 0.1 mm (0.005 in.) internal precision. The hydrostatic altimeter has 16 powerful built-in functions and a PC serial port. It will operate between -30 C (-22 F) and 70 C (158 F) for up to a year of daily use on a single nine-volt battery.